With teammates, family and friends in attendance, three of Murrah’s Lady Mustangs signed their letter of intent to play collegiate basketball next season. 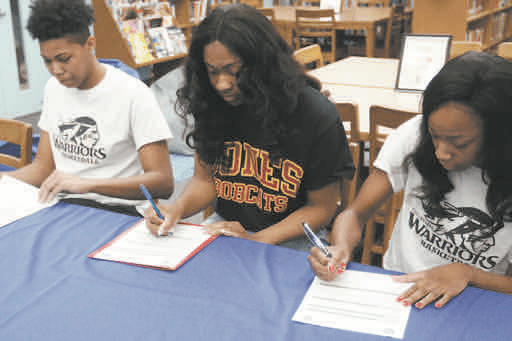 KeiMoya Walker, Jamaica Almons and Kacey Bradford are taking their talents to JUCO. Walker and Almons will be attending East Central while Bradford will be attending Jones Community College. All three ladies were instrumental in the team’s success the past four seasons. They won the state championship during their sophomore year; meaning they bring championship pedigree to their respective schools. Bradford joins Jones Community College, which is coming off back to back championship seasons themselves At 6’2” Bradford is expected to do her damage in the post. Almons, 6’1” and Walker, 5’9” are good cornerstones for East Central Community College’s new head coach LaTaryl Williams. Williams was hired in January to lead the women’s team after head coach Robert Thompson, coached the men and women last season.